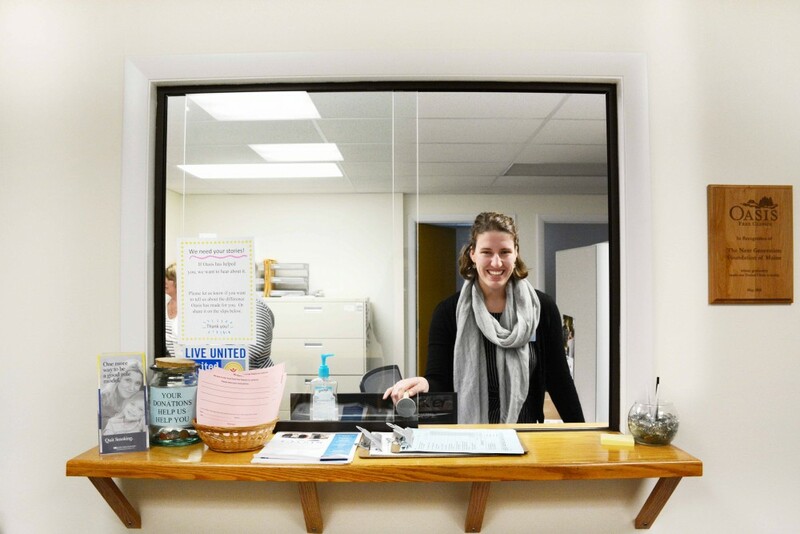 Sarah Steffen ’16 stands at the reception desk at Oasis Free Clinics. She started volunteering with Oasis during her sophomore year at Bowdoin. Students interested in public health and medicine have stepped off campus to volunteer at Oasis Free Clinics in order to gain an interdisciplinary perspective on practicing health care and supplement their experiences in the classroom. Oasis is an organization in Brunswick that offers free medical care to the uninsured and low-income members of the local community. Sarah Steffen ’16 started volunteering with Oasis during her sophomore year at Bowdoin. She graduated last semester and has been an employee at Oasis since January. Steffen said that her work with the organization has equipped her with a unique perspective on medicine and public health that correlates with her experience as a student in a liberal arts institution. As an employee at the clinic, Steffen coordinates Oasis’s events, manages its social media and is in the process of conducting a community-needs assessment to evaluate how the clinic can improve its care for patients. Julia Michels ’17 has worked with Oasis since the beginning of her junior year at Bowdoin. She said that shadowing physicians and interacting directly with patients has been the most rewarding part of her volunteer experience. Students are not the only Oasis volunteers with Bowdoin ties. Director of Health Services Jeffrey Maher volunteers at Oasis once every three weeks and is enthusiastic about helping connect students with Oasis. Maher became involved with the clinic before working at Bowdoin after being frustrated with his inability to treat patients without health insurance. He describes the community need which Oasis seeks to fill as endless. Anita Ruff, executive director of Oasis Free Clinics, emphasized the importance of volunteering for students interested in medicine. The opportunity to complete a rigorous education in a variety of disciplines while still pursuing a career in medicine is part of what drew Ilana Olin ’20 to Bowdoin. She hopes to start volunteering with Oasis. “I also really like philosophy, and not being on a strict pre-med track where every [first year] is doing the same thing, I have the opportunity to take the classes I want to and get a liberal arts education,” she said. Olin is a certified Emergency Medical Technician (EMT) and worked as a member of an ambulance crew during high school. At Bowdoin, Olin is part of the Public Health Club and volunteers at Partners for World Health, a Portland-based organization that sends unused medical products to developing countries. She is looking forward to joining Steffen in volunteering at Oasis, which she hopes will provide her with yet another perspective on what it means to work in the field of public health. “I think the more exposure I get to different areas of medicine, the more interested and more passionate I become,” she said. Oasis is not the only place where Bowdoin students have found an outlet to gain experience in public health. Mason Bosse ’18 believes that working or volunteering with medical organizations is critically important for students interested in careers in medicine or public health. Bosse is also a licensed Advanced EMT and works on ambulance crews based in both Lisbon and Lewiston, Maine and works as an instructor for United Ambulance in Lewiston. He leaves campus almost every weekend, departing on Friday and returning Monday morning.